The colored pencil medium is the most hassle free, comfortable and completely portable medium to color our drawings. I drew the landscape below out of my own imagination and then enhanced it using Photoshop to bring it into its present state and I think that it has turned out to be good. The original version (which I have posted below) isn't as attractive as this one. This is because of the loss of color while taking its photograph. However, that loss can be recovered to some extent and the image can be turned into a better one by using Photoshop. Here's the original (unedited) version of the same drawing above. 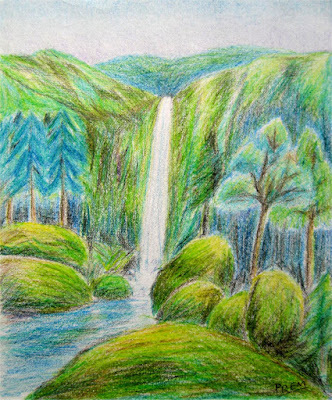 While composing this landscape I drew randomly without any planning or pencil outline. I even didn't imagine the image that I was going to end up with. 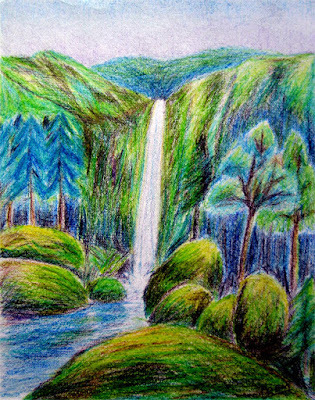 This landscape resembles the waterfall I used to see in the hilly regions of my country during my childhood. In the place I grew up, waterfalls were very common and you could see them falling down the hills in many places. Perhaps this drawing was shaped by one of those places. Your comments and suggestions on my artworks are always welcome. Thanks for your compliment. Photoshop can make the colors brighter and more vibrant with a few clicks. Since I don't have a scanner, I have to rely on camera which can't capture true colors until we manage just the right amount of lighting. The apparatus is costly and beyond my reach. Therefore, I have an easy way out with Photoshop. Of course, and your site is wonderful. Seems like we are on the same path! Your blog is great, a commonplace of all the things you love to talk about. After visiting your blog, I am inspired to do more arts by seeing your works. I especially liked your oil painting of a horse.